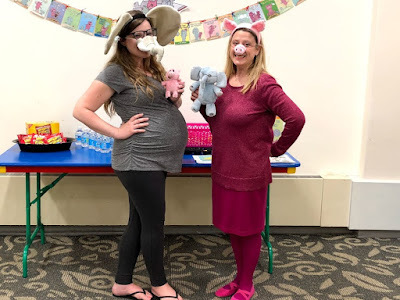 Approximately two years ago, my coworker Jen (also of National Oreo Cookie Day Taste Test) and I hosted an Elephant and Piggie Party to celebrate the release of the Thank You Book, the final book in the Elephant & Piggie series. WELL, it was so much fun that we decided to do it again! Just for the heck of it! 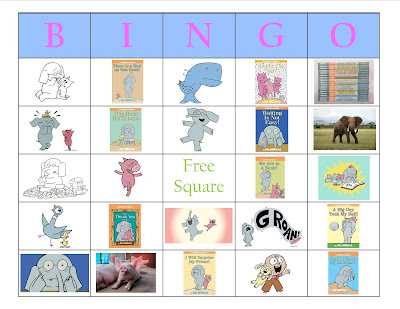 Because Elephant and Piggie never get old and are always in style. And also because we don't need a stinkin' book release to celebrate our love for these guys! We love 'em all the time! For ages 4-6 (aka the PERFECT age group for this), we tried this program from 4:30-5:00pm, a time slot neither of us would normally go for. It worked out! We had 15 kids signed up and 11 in actual attendance (two opted out of the group picture below). We started off with two dramatic readings: First, we did We Are In a Book (because, it's sort of just necessary?) and then we did Waiting is Not Easy (because Jen said it's appropriate for me as an 8.5-month-pregnant person and I sort of agree). 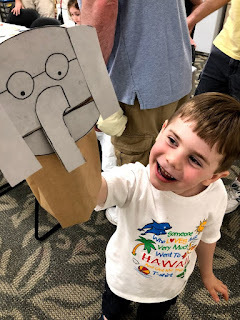 I feel like it's almost unnecessary to even say this but, OBVIOUSLY, the kids loved both books-- not because we're so awesome or because we chose the perfect stories (although we are and did), but just because you really can't go wrong with any Elephant & Piggie reading. At all. Mo took all the work out of it! We used M&Ms as Bingo markers but told the kids NOT to eat any of them until the game was over. Amazingly, they all listened! As usual (for me), I instructed everyone to keep their pieces on their boards between rounds. Then we played round after round until, eventually, everyone was a winner and everyone got a prize (from a basket of leftover stuff we had). 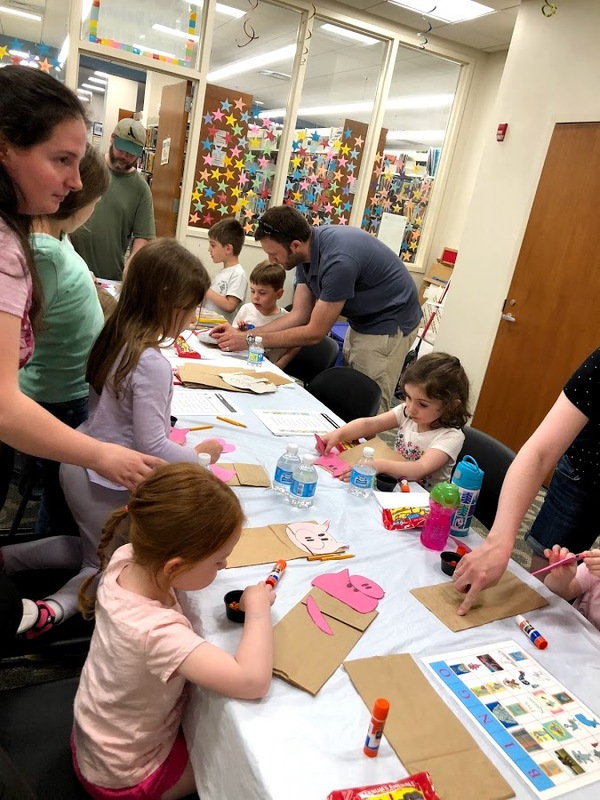 Paper bag puppets! She found the templates for these on the blog, Three Little Birds, and had a page pre-cut all the pieces so the kids could easily glue the parts onto the bags. Quick and easy and perfect for this age group in the limited time that we had! 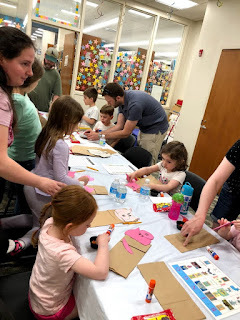 Our other activities out included Elephant and Piggie MadLibs (which you can download here), a Pig Day Scrambler (which you can download here), and a Pig Maze (which you can download here). The MadLib was a Pinterest find, while the Pig Day Scrambler and Pig Maze were both from The Happy Pig Day Kit, available through PigeonPresents.com (under "Grown-Up Stuff"). Also, we had Mo Willems stickers lying around the department so we gave those out too (as sort of a party favor), which was a fun surprise for the kids! What worked least: I don't think anything worked least about this program! It was all fun, timed out nicely, and, when it was over, one girl left the room asking, "When's the next Elephant and Piggie Party?" What worked best: I think our dramatic reading really shone here. I'm not sure how we looked to outsiders but to me, Jen and I really became Elephant and Piggie. My name is Laura. I've been a children's librarian on Long Island, NY for over 10-years. I got my MLS from Long Island University, where I specialized in all things children's and all things public libraries. 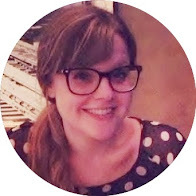 I live in a fairly new house about 45 minutes from my job with my husband (Elliott), my two young daughters (Sadie and Callie), and my cat (Benjamin). 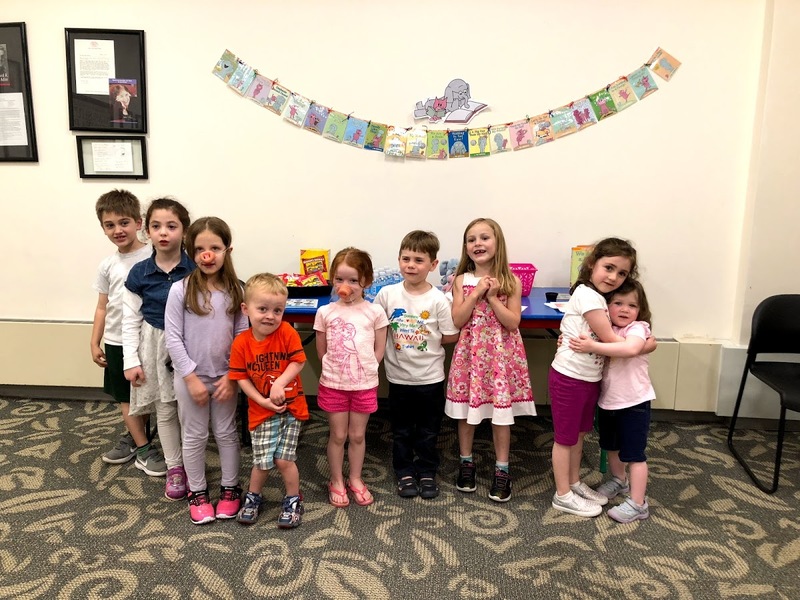 At work, I focus most of my time on the children who are five-years-old and younger, although, having gotten the opportunity to watch some of the little ones grow up over the years, I really enjoy doing an occasional school-age program as well. 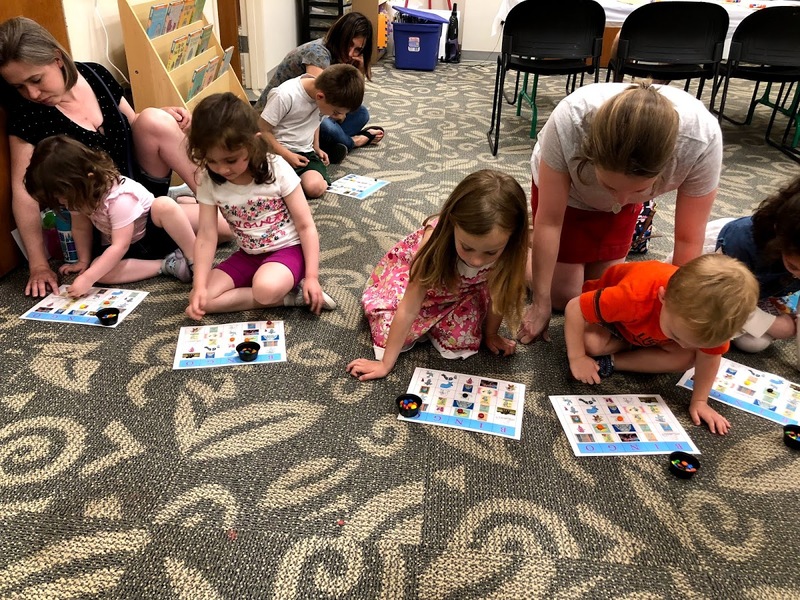 In my blog, I write about many of my children's programs, in the hopes that other children's librarians (or moms, or teachers, or camp counselors or whoever!) can benefit from some of my experiences. I love my job and I'm always excited about new programs and new ideas.